Whatever topic you search for, if there are social mentions from your contacts on Google+ then those pages will be the first results you receive. Even if your contacts’ posts have nothing to do with what you are actually searching for, because the search engine and the social network are linked they will appear. Therefore, if your business does not have a Google+ page or you are not actively encouraging your clients to write Google reviews for you, chances are your perfectly good business might become overlooked. It no longer matters how many Facebook fans or Twitter followers post their undying love for you, if you do not generate the same response on Google+ your business could be pushed below the fold. How to work with the new Google? Grow your circles by following people or organizations that offer similar or relevant products or services (Google). At first glance, Google+ appears to be a mysterious terrain for even the most experienced marketer; but in reality Google+ is still a social network. It should be used to engage your following in a meaningful way and can incorporate many of the same marketing techniques used for Facebook. It is also important to know that while Google+ is a trend every marketer needs to embrace, it is still too early to see the overall effectiveness of personalized results. 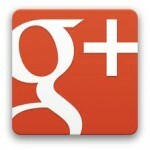 Only as more users sign up and become involved in Google+, will the true success of social searching be seen.